Half a pound of stewed pumpkin Three Eggs A quarter of a pound of fresh butter or a pint of Cream A quarter of a pound of powdered white sugar Half a glass of wine and brandy mixed Half a glass of rosewater teaspoon full of mixed mixed spice nutmeg, mace, cinnamon. Stew some pumpkin with as little water as possible. Drain it in a cullender and prep it till dry. When cold, weigh half a pound and pass it through a sieve. Prepare the spice. Stir together the sugar and butter or Cream till they are perfectly light. Add to them gradually the spice and liquid. Beat the eggs very light and stir them into the butter and sugar alternately with the pumpkin. Cover a soup plate with puff paste and put in the mixture. Bake it in a moderate oven about half an hour. This recipe was written well over a hundred years ago, by a Maria Lefferts. The Lefferts, one of the first families of Brooklyn, lived in the area that is now known as Prospect Park; one of their homes still remains as a historic site. Their papers reside in the collections of the Brooklyn Historical Society, which is where I came across this handwritten cookbook, and this recipe for Pumpkin Pudding. Pumpkin Pudding is better known today as Pumpkin Pie. I love cooking an American standard from a historic recipe because it often gives me a new perspective. 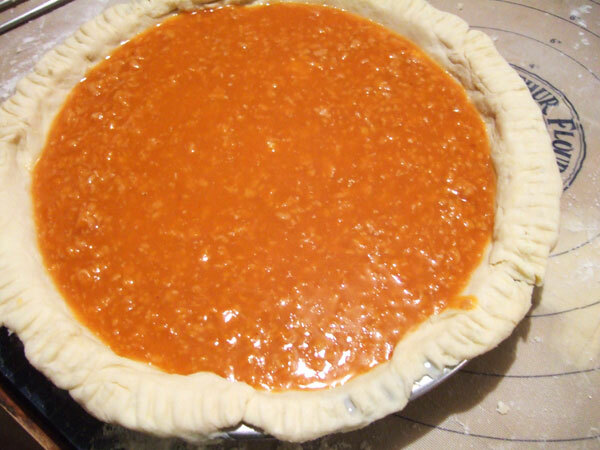 After looking at recipes from the late 18th century, I retronovated my yearly pumpkin pie recipe with a 1/4 cup of brandy and 1/3 cup of pure maple syrup. And I seldom make an apple pie without a dash of rosewater and some white wine. Mrs. Leffert’s recipe dates to about 1820; her instructions are refreshingly precise, almost modern. In most cookbooks from that time, let alone handwritten cookbooks, recipes can be as verbose as a list of ingredients. 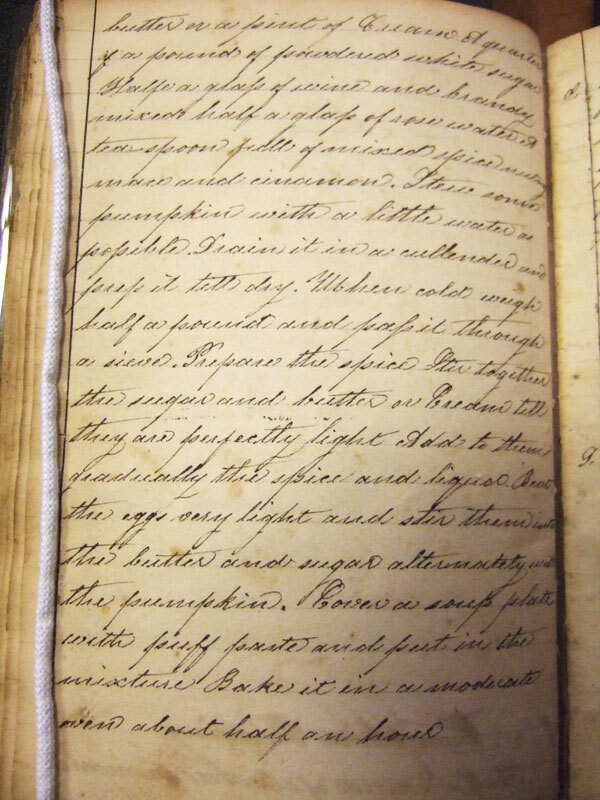 From the handwritten cookbook of Maria Lefferts, c. 1820. Preheat oven to 325 degrees. In an electric mixer, cream butter and sugar until light and fluffy. With the mixer on low, add spices and then brandy and rosewater. Beat eggs with a fork until light, then add them to the butter mixture, alternating with the pumpkin. 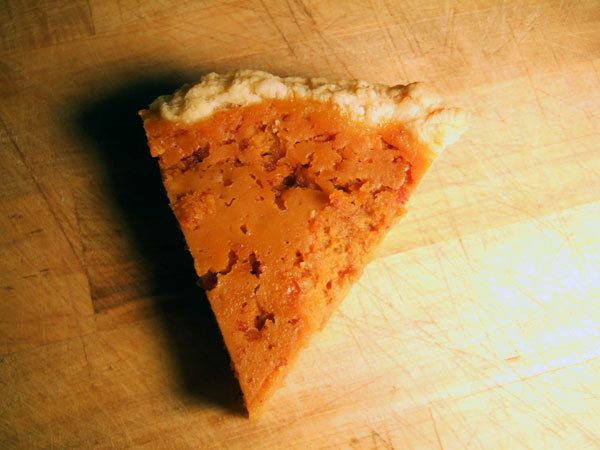 Press a puff paste into a pie pan, and fill with pumpkin mixture. Bake for one hour. Allow to cool completely before serving. Custard pies are always better the next day. For the crust, I used a basic puff paste recipe from the book Puff. I chose to use butter, instead of cream, because it is Leffert’s first suggestion, and it’s not an ingredient normally used in pumpkin pie. I was curious how it would change the texture. However, by the time the pie was mixed and ready for the oven, the butter had made it a lumpy mess. And in went the rosewater. While I was making the pie, the entire kitchen stunk of rosewater. While the pie was baking, a sickening-sweet rosewater smell drifted from the oven. When it was finally time to cut the pie and try a taste, the only flavor that my taste buds could understand was rosewater. Blech. While I don’t mind rosewater in appropriate quantities, that’s all I could taste in the recipe: the sweet, floral, citrus notes of distilled rose petals, in nauseating quantities. Even if I reduced the quantity of rosewater, I’m not sure how I would feel about it paired with pumpkin. I tend to enjoy it more is dishes that are slightly acidic, like apple pie. More than that, the texture was very unappealing. Oddly, it had a gritty mouth-feel. At any rate, the 190-year-old Pumpkin Pudding is coming into work with me today, so we’ll see what the verdict is from my coworkers. They’re nerds, so they’ll at least appreciate the history. Happy Thanksgiving! Mrs. Lefferts: I’ve had better. The modern day methods for steam distillation of rose flowers might far exceed that of colonial days by an order of magnitude or two. Intense rosewater had been made for centuries, but there’s a good chance that the person who wrote the recipe was crudely making their own at home using a pot, an inverted lid, a brick, and a cup. 2 oz of modern day rosewater would be sickening even if a lot of it boiled away in the cooking process. Also, there’s a good reason vanilla took over in baking by the mid 19th century. I had considered that, that perhaps my rosewater wasn’t as strong. But I feel like I’ve seen other recipes from this time with a reasonable amount of rosewater in it. And tooootaly–after vanilla became cheaper in the 1840s, it took over and rosewater never made a comeback. Note to all: we used to use rosewater everywhere we use vanilla today, because it was so much cheaper. so sorry it didn’t work.. pumpkin varieties were different too. one never knows about measurements… maybe she had a mixing glass that was tiny (some wine glasses were more like cordial glasses). I do LOVE the handwriting… it’s just gorgeous! Her handwriting is beautiful, isn’t it? I took this pie into work today and EVERYONE LOVED IT. People were stopping me in the halls–they said they loved the light texture and spicy, citrus flavor. Loved, loved, loved it. So, my taste can’t always be trusted. I truly thought it was awful, but maybe it is worth giving a try! FYI – I did some major database updates for this blog today, and lost a few of the most recent comments in the process. My apologies to Zaite and Sara; your feedback is always valued, and was not purposefully deleted.